I've mostly stopped reviewing traditional metal releases in recent years because time constraints dictate I must focus on big names and on my specialty genres. But every now and then a submission sounds too good from my initial 30 second preview to let go. 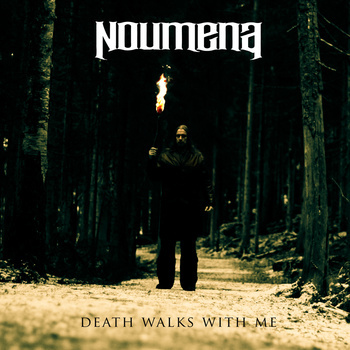 That's what happened with Noumena, a melodic death metal band to the letter from Finland, whose sophomore album "Death Walks With Me" teaches a lesson on how to best utilize melancholy within melodeath in the best Dark Tranquillity style. Now, few bands can impress anyone that quickly, so here's how Noumena have done it: they stick to the basics within the genre and ensure that the underlying foundation is in textbook order. The riff/growl combination, while drawing a great deal from Dark Tranquillity and older In Flames albums, is rock solid throughout. The solos are bittersweet and captivating, but also innovative and different. Perhaps more importantly, Noumena opt for a dual vocal approach, with Antti Haapanen's thick, melodic growls roar like the thunder in the soundscape thanks to a beautifully setup contrast between him and the band's female vocalist Suvi Uura. Her singing is soft and fragile, almost gothic metal-esque at times, but retains enough classical clean singing to steer clear from any further comparison to that genre. Her talent is especially on display during "Sleep", where the amounts of bittersweet melancholy are raised to their highest on the record; the juxtaposed part against the growls is a back-chilling moment thanks to crystal-clear, sharp production values. At the same time, the pace is kept at slow to mid tempo levels, creating a soundscape that slowly creeps forward and borrows elements from the melancholic doom masters in both Paradise Lost and Sentenced. It's moments like these coupled with excellent riffs and interesting song structures that make "Death Walks With Me" a great album. 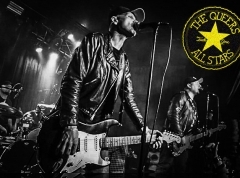 It's a refreshing, late 90s style take on the genre, without sounding all too retrospective or dated in its sound. Melodeath fans should lap this up with ease, but in my ears it's also a release that has potential for drawing in listeners not so accustomed to the genre, thanks to Suvi's sublime performance alongside Antti's growled vocals.